Islam was introduced into Egypt by Amr ibn el-As in 639 AD and Egypt changed forever after that. Islam is based on the recitations of the Prophet Muhammad who was born in 570 AD in Mecca, Arabia. At the age of 40 he received the word of God through Gabriel, the archangel and for 22 years, thereafter, he recited his revelations to his followers. Islam rests on the Quran (el-Quran means the recitation). In the quest of spreading this message, the converted Arab armies led by his followers in Baghdad, conquered the Byzantine and Persian empires. If there is time to see only one mosque in Cairo, it has to be the Ibn Tulun Mosque. 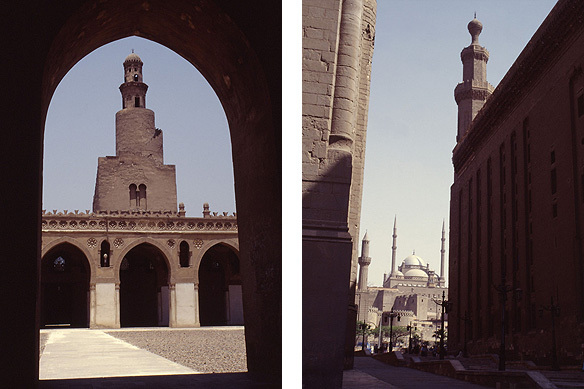 Built in the 9th Century by Ahmed ibn Tulun, it is the oldest surviving mosque in Cairo. The edifice is impressive both for its large scale and minimalist classical lines. The vast courtyard is covered with pebbles, the pointed arches made of brickwork and stucco, and the spiral minaret seems to have been borrowed out of a fairytale. A 2-kilometer long wooden frieze inscribed by one-fifteenth of the Quran runs below the ceiling. Cairo knew its moments of greatest splendour in medieval times. The Fatimid rulers from today’s Tunisia invaded Egypt around the 10th Century and laid the ground plan for their capital city el-Qahira, the triumphant, namely Cairo. The Fatimid empire contained great wealth. They built fantastic palaces throughout Egypt, as well as Islam’s first university-mosque, el-Azhar meaning the ‘most blooming’. Claimed to be the oldest existing university globally, it is the leading centre for Islamic theology in the Arab world. Over 25,000 students from all over the Muslim world currently study here. Fatimid rule ended without a fight in the 12th Century, giving way to Syrian troops led by Salah ad-Din, a young Kurd famed for his jihad, holy war, and in bringing Egypt back under the religious authority of Baghdad. Salah ad-Din turned his back on the palaces and built himself a large fortified citadel atop the hill with limestone blocks from the Giza pyramids. Not much of the original buildings remain as they were torn down by subsequent rulers to make way for their own mosques and palaces. Much of present day Cairo’s appearance was shaped during the period of the Mamluks (13th-16th Century). Mostly Turkish slaves, they were brought into Egypt, converted to Islam, taught how to fight and then given their freedom. Though their lives were filled with violence, their monuments displayed taste and talent. The Sultan Hasan Mosque-Madarasa, built by Sultan Hasan (14th Century) is still one of the world’s largest mosques. Covering an area of approximately 8,000 sq. meters, the complex includes a mosque, tomb, madarasa (theology colleges for the four Quranic schools along with apartments for the students), a well and a market. The Mamluks were followed by the Ottoman Turks from Central Asia who ruled Egypt from the 16th to 18th Century through a governor based in Istanbul. The Ottomans had little interest in Egypt. All that mattered was that Egypt should not revolt and pay its taxes regularly. Next to Ibn Tulun’s Mosque is the Gayer-Anderson House, a fine example of an Ottoman house. Part of the Museum of Islamic Art, it comprises two houses joined by a passageway. An Englishman, Dr. Gayer Anderson, doctor to the royal family lived here in the early 20th Century, and restored and decorated it with its current furnishings. In 1805, the people of Cairo finally insisted that Muhammad Ali be made their ruler, bringing direct rule back to Egypt after three centuries. Muhammad Ali founded a dynasty which lasted till the revolution in 1952. The Mosque of Muhammad Ali stands adjacent to Salah ad-Din’s Citadel. Modelled on the same lines as the Blue Mosque of Istanbul, its minarets tower high over Cairo’s skyline, the enormous dome supported by four semi-domes. The decor within is Baroque, rich and highly decorative; the massive rings of lights and the exquisitely painted domes create a vision of space and beauty. Muhammad Ali is buried under a marble cenotaph inside the great hall. No trip to Cairo can be complete without a visit to Khan el-Khalili, Cairo’s most exciting bazaar going back to the 13th Century, with its narrow alleys crammed with antiques, jewellery, gold, silver, leatherwork, carpets, perfumes and spices. To buy or not to buy. Just never say no to a bottle of magical, mystical Egyptian perfume—Queen of the Desert, Lotus of the Nile—and a hand-painted papyrus illustrating scenes from ancient Egypt. The sun sets and darkness falls. It is time to leave, but before you go, come take a ride on a horse carriage under the moon and be part of Cairo’s 5,000 year old soul. This entry was posted in Egypt, Exploring our World and tagged Egyptian History, el-Qahira, Fatimid Rule in Cairo, Ibn Tulun Mosque, Islam First University, Islamic Cairo, Khan el-Khalili, Mamluk Rule in Cairo, Mosque of Muhammad Ali, Museum of Islamic Art, Ottoman Turk Rule in Cairo, Salah ad-Din, Things to see in Cairo by Rama Arya. Bookmark the permalink.